Barbecue! One never gets tired of it. 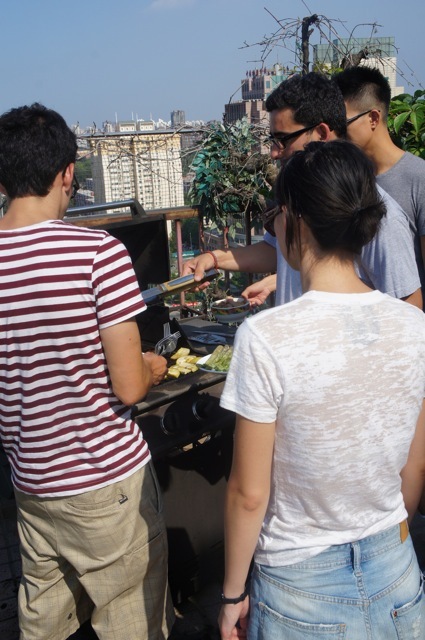 The past Saturday may be a little bit too hot for such an occasion, but since everyone was up for it, the summer interns of MCO gathered at Chris and Miranda’s lovely roof garden with steaks, sausages, and other food we bought at Jenny Lou’s. Chris was in charge of the grilling. Most of us just kind of hung around playing with Fancy (who's a cat that resembles Puss in Boots to such an extent it's actually scary). Chris is happy with his food! The best part of the BBQ was unarguably the dessert. We stuffed chocolate into bananas and grilled them, before mixing them up with vanilla ice cream. I could eat this and nothing else for the rest of my life, but my superego scolded me of putting so much sugar into my future plans. Anyway, it doesn't hurt to have some sweets for a lazy Saturday afternoon, does it?